CREDIT, will it remain available and affordable for Canadian farming businesses? Between 2005 and 2014, farm debt has increased by 43% to reach almost 85 billion dollars (constant 2014) in Canada. The gross value-added (in constant dollars) of the Canadian agriculture increased by 23% over the same period in a context of historically very high agricultural prices. If the last decade was to repeat itself over the next one, farm debt would reach more than 120 billion dollars in 2014 terms. Canadian farming businesses may need tens of billion dollars of additional credit over the next decade in order to remain competitive and to make farm assets transfer possible. Credit availability and affordability has not been a critical issue so far, but it will be unwise to assume it won’t be in the future. In a previous post, I questioned the financial capacity of the Canadian agriculture as a whole to increase significantly its indebtedness over the next 10 years. In this post, I want to open a discussion about the availability and affordability of agricultural credit from financial institutions over the long run. Understanding how a credit portfolio is managed is critical for any business or sector, which will need to access credit to fund its development. It is all the more so when credit is overwhelmingly the primary source of capital such as in the case of the Canadian agriculture. Is the Canadian agriculture falling into a debt trap? With agricultural commodities prices falling and the prospect of rising interest rates getting closer, I thought it could be interesting to see where the Canadian agriculture stands debt-wise. In this post, I will look at the indebtedness in two ways. Firstly, farm indebtedness will be assessed relative to the output of the Canadian agriculture. We start by deflating the farm debt value by the CPI. The output is derived from the value of the production (farm sales and change in inventories) by deflating it by the farm products price index. By building an index, we are able to obtain the change in our ratio [Farm debt / Output]. We do the same with the Gross value added (GVA) of the Canadian agriculture and the total value of farm assets (real estate and quota). the significant decrease of the economic efficiency (GVA/Output) of the Canadian agriculture over the period considered here (1981-2014) though it has bounced back a bit over the last 10 years thanks to high prices. from 1995, the divergence of dynamics between, on one hand indebtedness and farm assets value, and on the other economic efficiency. Secondly, we will look at the indebtedness in the Canadian agriculture through the ratio (Farm debt outstanding)/(Maximum farm debt). Debt service coverage ratio of 1.1, calculated as Earnings before Interest, taxes, Depreciation and Amortization (EBITDA) divided by Principal plus Interest payment. Using Statistics Canada data, EBITDA is approximated by Net cash income plus interest. Because of the intrinsic volatility of farm income, we will use a 3-year average of net cash income before interest in place of the current value to calculate our debt repayment capacity. Repayment period based on useful life of assets. Usually, it is based on the weighted average of the useful life of the different asset classes. However, in order to assess the maximum level of debt, we could use a 20-year repayment period providing the ratio Maximum debt to total Land value remains below 75%. If that ratio was to be above 75%, we would have to revert to the weighted average, with 15 years a good benchmark. Prudent interest rate: the 5-year conventional mortgage rate which is commonly used to stress-test credit risk of agricultural loans. Comparing it to the apparent average interest rate paid by farms, we could note that from the mid-90’s, the spread between the two interest rates is relatively stable. The graph below shows that indebtedness capacity became more and more saturated until 2005-2007. Then, lower interest rates, increasing farm products and farmland prices, all contributed to raising the maximum farm debt. We note that two provinces stand out : Saskatchewan and British Columbia (BC). The former has experienced a remarkable drop in indebtedness saturation because all the recent trends mentioned previously were amplified here. The latter, a contrario, has experienced a very significant jump with a current indebtedness saturation of more than 100%. How is that possible? Short answer: off-farm income, low interest rate, non-standard lending term and conditions, farmland prices driven by non-agricultural factors. Now, we will assume that the interest rate gradually reverses to its 20-year mean over 10 years while debt repayment capacity, farm debt and land value remain constant. That sole change would lead to increasing saturation of the indebtedness capacity. However, we could construct realistic scenarios which would lead to a much faster saturation. As far as I am concerned, the debt problem of the Canadian agriculture is not a problem of solvency. The Canadian agriculture is solvent. I do not foresee any collapse of crisis-scale within the next decade. It is a problem of restricting the ability of the Canadian agriculture to sustain, over the long term, a level of investment consistent with the competitive pressure, the pace of innovation and of demographic change. Then, questions come to mind: Why debt? Are there other sources of capital available? This is a first-level analysis at a very aggregated level. To assess the risk identified here adequately, we need to dig deeper and go to disaggregated levels. Preliminary results show differences along industry and farm-size lines. Supply management : nobody is getting the facts right. Here are some examples. Apparently, neither proponents nor opponents of supply management are able to present their figures in an unbiased rigorous fashion. Consolidation of dairy farms has been faster in Australia than in Canada. Well, it depends on the period you want to consider. For instance, between 1970 and 2014, consolidation has been faster in Canada. Over this period, the number of Canadian dairy farms decreased by 78%, 71% in Australia. For the period 2008-2014, the rate slowed significantly in Australia to 16% (8% in Canada). Production wise, between 1970 and 2013, Australia experienced a 23% increase while production in Canada barely grew (+1%). Between 2008 and 2013, production grew by 3% in both countries. However, there is one common dynamic: the five to ten-year period following a significant policy change (introduction of supply management in 1970 in Canada, deregulation in 2000 in Australia) saw a rapid consolidation and a drop in production in both countries, which is to be expected as farms have to adapt to a new environment and delayed changes are accelerated. Besides, it is interesting to see that nobody talks about the extreme drought experienced by many Australia regions between 1995 and 2009 (especially between 1995 and 2003) and how it has affected dairy farms, most likely magnifying the effects of deregulation. Similarly, since the introduction of a price cap on quota in 2007, quota markets in Canada are feeble and the recent consolidation rate in Canada has been slowed somehow artificially. I also find a bit misleading the comparison of milk retail price used by Dairy Farmers of Canada, especially in the case of France, a country I know very well. Unlike Canada, most of the consumption of fluid milk in France is made of UHT ½-skimmed milk (about 70% of fluid milk retail market). The average price per liter of UHT ½ skimmed milk in France was 1.15 CAD according to official statistics, not 1.81 (the price of fresh whole milk). I have not checked yet any such discrepancies for the other countries used in the comparison. Any relevant comparison of milk price must account for the differences between milk consumption patterns. 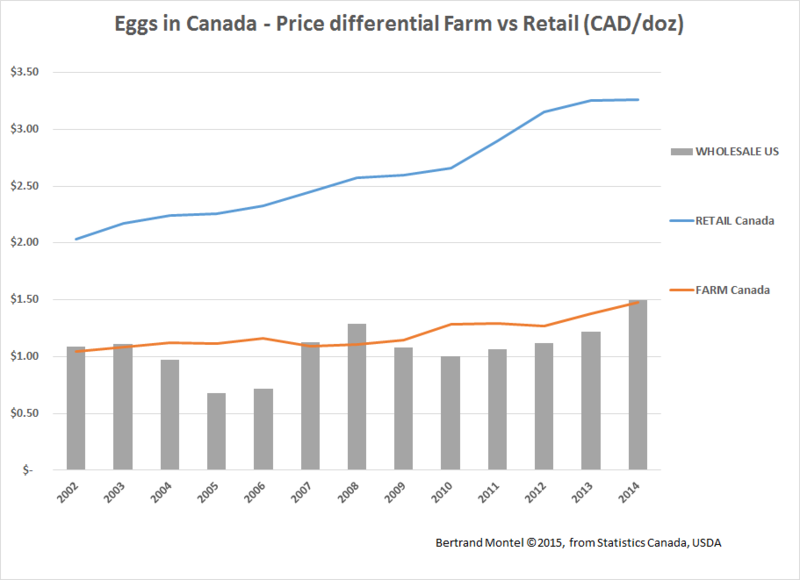 Talking about price, I took a look at egg prices in Canada, at the farm gate and on the retail shelf. It was very instructive. First, farm gate prices in Canada are in line with wholesale price in the US. This means that Canadian egg producers could be competitive on the North-American market, especially considering the strength of biosafety protocols in Canada. However, the most interesting thing is the differential between farm gate and retail prices which has been growing for a decade or so (see figure below). Regarding economic contribution of the dairy industry, the proponents of supply management tend to forget to outline that about a third of contributed jobs and GDP, half of fiscal revenues come from the induced effect, which is the most tenuous one and is widely debated in economists’ circles as to its relevance. Besides, they do not highlight how Saputo and Agropur are the cornerstones of the industry nor do they show what would be lost in phasing out supply management (perhaps they want us to believe that all would be lost). We could fight over these figures forever and forget what the real issues are. The real issues for the dairy industry are that strengthening forces are weakening the three pillars of supply management: import control, production discipline and price fixing. I have discussed them in a previous post. Like any public policy, supply management has an expiry date, and my guess is that it is before 2030. By then, supply management could well be about 6,000 dairy farms, a handful of dairy processors, and a few retailers fighting over a dormant market, triggering at some point a major crisis originating in a spat between Ontario and Quebec. The dairy industry itself will ask for dismantling supply management, but it may well have lost any political goodwill – the fourth pillar of supply management – to fund the transition by that time. Some people should really think honestly about the two following questions: how long can we expect to make supply management work in the interest of most of its stakeholders? Are we sure we can get enough political support for massive assistance funding when time comes? Right now, there is an apparent consensus on the fact that phasing out supply management requires financial assistance for dairy farmers and processors. The industry should take advantage of that to develop a vision and a strategy, and start investing in its future. In a previous post, I have highlighted that supply management will likely be phased out within the next 15 years, either because of trade agreements or because of internal tensions which could morph into fault lines. I have been quite critical of some of the arguments used by the proponents of supply management because they don’t pass the test of facts. I will be equally critical of some of the arguments of the adversaries of supply management. Martha Hall Findlay and Jack Mintz recently published an opinion piece in the Globe and Mail in which they outline a possible scheme to phase out supply management in Canada. Their proposal is to transpose to Canada what was implemented in Australia following the deregulation of the dairy market in 2000, namely a temporary levy on fluid milk sale to finance a quota buyout to help dairy farmers transitioning to an open market. However, one key element seems to be missing there : geography matters to trade patterns. The Australian domestic market for fluid milk is, well, quite insulated from any competition. Therefore, substitution by cheaper imports was not a threat to Australian dairy farmers on that specific market. In the case of Canada, the situation will be very different. If a levy was imposed on any fluid milk sale in Canada while the market is totally open, the retailers would have many incentives to substitute Canadian milk by cheaper US milk. One fact to remember here: the US states neighbouring our border produced in 2014 about 5 times more milk than Canada in its entirety (Wisconsin alone produced more than Canada). The threat of substitution will be very real in the aftermath of a brutal end of supply management. Moreover, such substitution by retailers would happen very quickly, much faster than any adaptation at the farm level. While operating costs are fairly similar on average between dairy farms in these US states and Canada, capital and labour costs are quite higher in Canada, partly due to unrealized economies of scale. Consequently, to have a chance to compete against US dairy farms, Canadian dairy farms must be given time to transition and realize their economies of scale. In these conditions, I think that an Australian-style levy on fluid milk would have dire consequences on the Canadian dairy industry. The current debate has been painting supply management as the last Canadian obstacle standing in the way of the TPP agreement. Obviously, this is not true as many other issues are contentious but too often perceptions are stronger than reality. In the meantime, the dairy industry contributes significantly to the Canadian economy. So, we could say that the stakes are high. Unfortunately, the public debate is rather poorly informed and too many arguments – for or against supply management – are weak, resorting to wishful thinking, twisting facts. What is particularly missing is foresight. Fortunately, the federal government has a group dedicated to such exercise, Policy Horizons Canada. Perhaps, it could be mandated to lead a foresight study of Canadian supply-managed industries, allowing scenarios with and without supply management in different forms. The phasing-out of supply management in Canada will be initiated before 2030, regardless of TPP. The current debate about the TPP negotiations and their consequences for the future of supply management in Canada is not about the merits and benefits of supply management themselves. It is about Canada’s bargaining power in negotiations it has been invited to and to which it may not be an essential party. As of now, it seems that Canada has a rather weak hand and will have to commit to open its dairy market somehow or risk being sidelined. I’m not privy to the negotiations and my opinion has been forged on what has been publicly disclosed. Supply management has undeniably served the Canadian dairy industry very well, allowing among other thing dairy farmers to increase their income and wealth over the years and two dairy processors (Saputo and Agropur) to develop into major global players. Over the period 1998-2014, the number of dairy farms has been almost halved. Production has increased only by 4%, following a sleepy growth in consumption of dairy products driven by demographics and changes in food consumption pattern. Today, the three largest dairy processors control about 80% of the market. The Canadian dairy industry could be said to be relatively mature. However, even if supply management survives the current TPP negotiations, its future is uncertain as adverse forces are gathering strength, threatening the three pillars of supply management (import control, producer pricing and production discipline) from within. The strongest force is the weakness of growth potential in the domestic market which, because of supply management, will translate into a marginal production increase. On the processing side, maintaining or increasing margin will then require to lower supply cost, which will result in a downward pressure on milk price and concomitantly in an increased use of imported ingredients which in turn will reinforce the former. In the meantime, and considering productivity gains and labour shortage in dairy production, there will be tremendous pressure to realize some economies of scale at the farm level to limit the ongoing deterioration of profitability in many dairy farms. Even so, more voices getting louder may call for increasing market potential by making it possible to export Canadian dairy products, which would antagonize import control. Now the second significant force, quota mobility. Pressure to further consolidation at the farm level will certainly build up as previously shown. This will require that quota is made available for purchase. However, the quota exchange market has become rather illiquid over the last seven years or so. This change has been most remarkable in Ontario and Quebec after new regulations of quota exchange were introduced in 2007. A trigger is needed to incentivize the sale of quota. Will it be sufficient to decrease milk price? Shall we lower the existing price cap? Shall we let the price be set freely? Shall quota move unhindered between province? All this in a context where there are expectations to maintain as many dairy farms as possible in as many regions as possible. Quite a catch 22, isn’t it. Some unruly producers may end up challenging production discipline. The third force is indebtedness arising from the cost of capital which in turn stems from the price of quota. Indeed, one must not forget that acquiring quota is just the first step but a costly one. Additional investments (buildings, equipment, farmland, herd genetics, etc.) are needed to maintain consistent dairy production systems. This will be especially critical in Quebec where almost all dairy barns are of the tied-stall type, which is ill-fitted for the automation of milk production processes. Besides, these barns are ageing, which combined with work overload could make it more difficult to maintain good herd health status and consistent milk quality, both being key to the farms’ competitiveness. Consequently, heavy investments will have to be made over the next ten to fifteen years in order to achieve a full-scale modernization of Quebec dairy production. Meanwhile, the sources of capital available to the Canadian agriculture are essentially restricted to debt. Already indebted farms will thus have to carry on more debt, pressuring their profitability further. Quebec dairy farms will be particularly exposed to that risk. Here, it is worth remembering that, for instance, if the current dairy crisis in New Zealand has indeed been triggered by a sudden drop in price, one of the main structural fault lines has been excessive indebtedness. So, the very economic sustainability of many dairy farms will hinge on higher milk price while the most efficient ones may still prosper in this lower-price environment. Consequently, producer pricing will become even more conflictual as increasingly diverging interests are expressed along the value chain and within different groups of stakeholders. These conflicting dynamics may give enough strength to centrifugal forces, make one of the, or all three pillars of supply management crumble. Quebec may well be at the epicenter of this quake. This is why I think the phasing out of supply management will be initiated before 2030, regardless of any trade negotiations. Supply management as such is a sound policy. However, it cannot pretend to remain unquestionably relevant forever. This is why I think it is time to engage in a comprehensive review of supply management, followed by an open debate over its future, over the why and how of supply management. TPP needs to be perfected and openly debated, but supply management should not prevent Canada from negotiating it. The Trans-Pacific Partnership (TPP) negotiations have recently come back to the front pages, triggering unsurprisingly calls in Canada to defend supply management from the dairy producers’ representatives, officials and politicians responding that they will never surrender supply management. However, I am deeply skeptical about that latter commitment if the federal government was to face a choice between being excluded from the negotiations and increasing access to the Canadian dairy market, if it came to that and in these terms. First, a few words about the TPP itself. It is part a new set of regional economic and trade agreements that includes the Canada Europe Trade Agreement (CETA) and the Transatlantic Trade and Investment Partnership (TTIP). These agreements intend to go beyond market access issues to set harmonized rules about trade and investment and are seen by the USA as core to their global strategy (This article in Foreign Affairs). These agreements are the subject of intense debate about their actual economic and strategic value (Paul Krugman , The Economist, Martin Wolf, Lawrence Summers). Besides, their negotiations have been wrapped in secrecy, raising fear that corporate interests will be served first, especially in the light of the controversial Investor State Dispute Settlement (ISDS) clause. The latter may indeed contribute to define the balance of power between sovereign states and corporations (to get an idea of the debate on that subject, read this and this and this). As a citizen, and considering the scope and reach of the TPP, I would like a more open debate on the principles and guidelines defining Canada’s position in the negotiations. So, I am not surprised that TPP and TTIP are encountering some resistance in the various countries involved in these negotiations. The completion of the TPP and its actual implementation are then still far from certain. Back now to the recent headlines of US officials publicly requesting Canada to open its dairy market in order to stay in the TPP game. Canada might have some chips to bargain with (Keystone pipeline is one but a weakening one, apparent breach of NAFTA by US bank’s reform may have more traction) but I do not think they would be sufficient to avoid choosing between being part of the TPP and opening the dairy market. Canada is not essential for the TPP’s success as far as the most important parties (The USA, Japan) are concerned. I do not think there would be too much procrastination about excluding Canada if it is politically more convenient to do so. Now, is TPP essential to Canada? Maybe not essential but not being part of a functioning TPP would be quite detrimental to Canada’s economy. Not that much because of market access issues but mostly because of the loss of attractiveness for investors and its ripple effect throughout our economy from R-D to infrastructures. As far as the TPP negotiations are concerned, the most pressing issue is whether President Obama will be granted Trade Promotion Authority by the Congress. If not, the negotiation would probably stall if not die as the polarization of the US Congress is such that it brings too much unpredictability into the US negotiating position (This article in The Economist). The current politicking makes it hard to predict the outcome, with some simply asking for not hastening the negotiations. However, we cannot exclude the possibility that the Obama Administration will indeed be granted TPA and will look for accelerated negotiation rounds. So, if the USA keeps on asking Canada to open its dairy market as a condition to stay in the game, it will be very difficult for the federal government to elude a decision, and this even in the midst of an election campaign. What would then be the most likely decision of our federal government? On one hand, the Conservative government could be wary of opening the supply-management Pandora’s box. It is not a wedge issue. The privatization of the Canadian Wheat Board is not looking that beneficial to the farmers. The recent NDP victory in Alberta is challenging the Conservatives supremacy in the Prairies. The Conservatives need to make in-roads in rural Quebec where dairy producers are still seen as influential. On the other hand, as outlined before, I do not think Canada can afford to be excluded of the TPP negotiations at this point. This government likes to present itself as a practical, result-oriented, reasonable government, working hard on ensuring Canada’s prosperity. Would it risk Canada being excluded from the TPP negotiations? Ultimately, I do not think so because that political inconsistency may come back to haunt the Conservative party. Then, how would the government proceed? Most probably by committing to increase market access at a level acceptable by the US. The key elements to negotiate would be the class of products, the allocation process of the import quotas, and the time-frame of implementation. That would undoubtedly have consequences on the Canadian dairy industry, most of them detrimental in the short-term. However, it is sterile to claim that Canada has to defend supply management at all cost. It is sterile, and it may even backfire. If a narrative can be built that says the dairy industry is weakening Canada’s position in the negotiations while a lot is to be gained, then it will bring a lot of scrutiny on supply management. Its shortcomings will be exposed and open for debate… which would be good in itself. Supply management is a public policy and as such should be submitted regularly to a thorough assessment of the relevance of its objectives and consistency of the underlying system. Its continuation should be publicly debated, beyond dogmas and opinion polls. Finally, if the dairy market was more open to imports, that would not mean an overnight collapse of the dairy industry contrary to what is implied by the current use of a study on the economic contribution of the Canadian dairy industry (report available here). This report clearly demonstrates the extent of the contribution of the dairy industry to the Canadian industry and it is undeniably significant. It does not say though what share of this economic contribution is at risk, assuming an open dairy market in Canada. Is anyone really thinking that Saputo and Agropur would close down all their Canadian operations because of more open markets? Has supply management prevented any consolidation and rationalization in the dairy industry? It would be even more interesting to evaluate and compare different scenarios, under supply management and under open market, based on the economic contribution of the dairy industry at the 2025 horizon. The significant contribution of the dairy industry to the Canadian economy, and its apparent reliance on a public policy to prosper oblige it to engage in a more sophisticated public discussion about its future than the current ‘’for or against supply-management’’ argument. Supply-management is a sound policy, but not always and surely not forever.